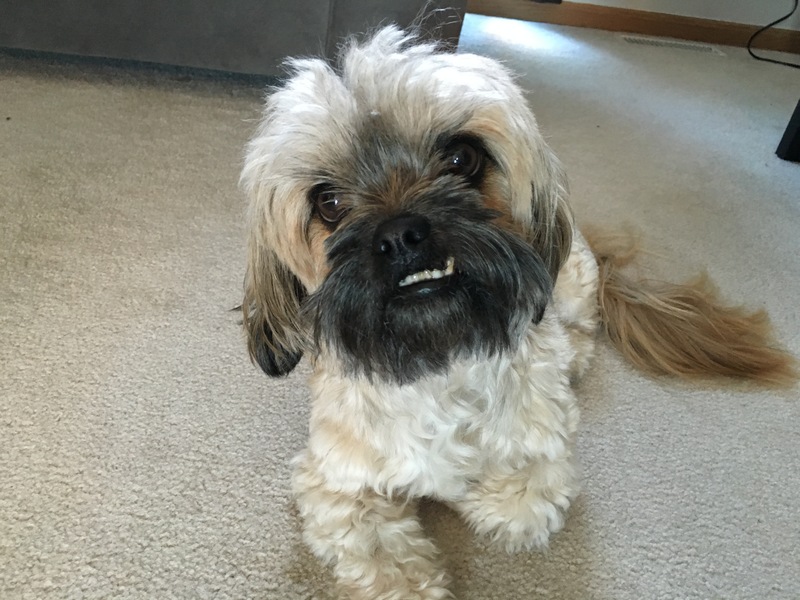 Howard is a two-year-old Shih Tzu mix who is marking in the house, growls occasionally at male visitors and gets excited when people come to the door. When I arrived for the session, Howard’s guardian was holding him; something that she did when guests arrived to prevent him from nipping them. The problem with this approach is it does not teach the dog anything and in fact can artificially inflate the dog’s sense of authority or rank. The higher dog is positioned typically the more rank or authority it has. I had the guardian place Howard back on the floor and once she did he rushed over to me to give me a good sniff. This is an appropriate greeting for a dog. After meeting me with his nose, Howard proceeded to go up the stairs and then get on top of the back of the couch near the stairs. Once I started to come up the stairs, Howard started to emit a low growl while staring at me. This was essentially Howard’s way of communicating that he did not invite me into his home and disagreed with my presence. When a dog feels that it is its place to disagree with visitors and is marking things in the home, it’s a safe bet to assume that that dog thinks it is in a leadership position. Often this is the case when a dog’s guardians do not have many rules or structure for the dog, over pet it or pet it at the wrong times. In Howard’s case, this is likely a result of the guardians failing to provide him with much in terms of rules or structure. I made a couple of suggestions to help start changing how the dog perceived himself in correlation to the authority of the humans in the home. One of the first things I suggested was to start Petting the dog with a purpose. This is probably one of the easiest habits for any dog guardian to adopt that has the biggest influence on their dog’s behavior in a positive way. Next I went over a Leadership Exercise that I developed a few years ago. The exercise helps the dog look to the humans for guidance and leadership while also giving up the ability to practice restraining itself and increasing it self-control. Because security for the pack is typically a job handled by an authority figure, I knew it would be important for Howard’s guardians to effectively demote him out of this position in order to stop these unwanted behaviors. I used the arrival of Howard’s other guardian to demonstrate how to claim the door. By claiming the area around the door and only opening it after the dog had moved behind a boundary, I was able to communicate to Howard that his services were no longer required as a bouncer at the door as I had the matter in hand. But the important thing isn’t that I can get the dog to behave, it’s that I can get Howard’s guardians to be able to achieve the same results. I had the other guardian step outside and wait a few minutes before knocking so that we could practice the exercise again; but this time it was Howard’s guardian who answered the door. Ironically it was the guardian’s other dog that had more difficulty staying away from the door than Howard. He picked thing sup right away. It will be important for Howard’s guardians to provide him with clear leadership and structure in order for him to change his perception of authority. Once the dog no longer identifies as being in a leadership position, it will seem inappropriate for him to mark on objects in the home or disagree with the arrival of a guest at the door.